What Was an Enron Spinoff Doing in the Middle of Guatemala’s Corruption Scandal? AEI was formed out of Enron’s ashes. 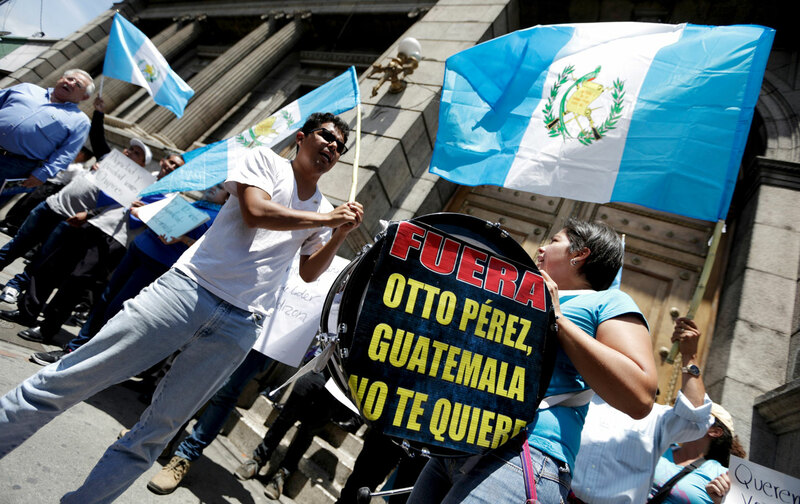 Now its subsidiary is accused of bribing top Guatemalan officials. AEI is a shadowy energy firm, managed out of Houston, Texas, with a huge problem on its hands. Its subsidiary in Guatemala, a country known for corrupt politics, civil war, and social inequality, is accused of paying bribes to get special government treatment. Back in the day, such behavior would have gone unnoticed. But a massive anti-corruption probe, driven by local and international prosecutors, has upended political life in the small Central American nation and put a solid portion of its governing elite behind bars. An American subsidiary, meanwhile, got caught in the middle. This article was reported with assistance from U.C. Berkeley's Investigative Reporting Program. AEI emerged from the Enron collapse, after a Cayman Islands–based investment group called Ashmore Energy International bought up the bankrupt giant’s international assets in 2006. Today, the privately owned firm operates pipelines and electricity generators in places like Brazil and Peru. One of its biggest projects is in Guatemala, where its subsidiary, Jaguar Energy Guatemala, owns a 300-megawatt power plant on the country’s western coast. According to AEI’s SEC filings, Jaguar Energy Guatemala is legally incorporated in Delaware. Jaguar’s $900 million power plant, the company claims on its website, is “the largest private investment” in the history of Guatemala’s electricity sector. That historic achievement, however, did not come cheap: Prosecutors say Jaguar Energy participated in an influence-trafficking scheme to obtain privileged information and favors from high-level Guatemalan officials. Among other things, the subsidiary is accused of paying to obtain meetings with the country’s former president Otto Pérez Molina. Jaguar Energy's alleged crimes helped bring down one of the Guatemalan president's closest advisers as well as a former cabinet minister. The accusations against Jaguar are part of an unprecedented United Nations–backed investigation into Guatemalan political corruption. The International Commission Against Impunity in Guatemala, or CICIG, a prosecutorial body with authority under Guatemalan law and backing from the UN, is leading the effort. With startling aggressiveness and wild success, it is reintroducing accountability into a governing system plagued by cronyism and impunity. In early September, thanks to the commission’s work, president Pérez Molina followed his private secretary, his mining minister, and his vice president to jail after resigning in disgrace. He is accused of taking part in a vast criminal conspiracy to defraud the country’s customs system. The president’s former secretary and mining minister, meanwhile, are accused of accepting bribes from and selling influence to multiple companies, including Jaguar Energy. Jaguar was just one player in one case among many that CICIG has brought forward in its war on corruption. But the company’s alleged crimes helped bring down one of the Guatemalan president’s closest advisers as well as a former cabinet minister. In the process, its misdeeds played a key role in the historic crumbling of the Pérez Molina administration, although the president himself was not implicated in the case. His fall came later and, in a nation where presidents, generals, and their friends live above the law, it was historic. So far Jaguar’s employees in Guatemala have avoided arrest, although at least one is charged with conspiracy. The big question now is whether the subsidiary, its employees or its parent company, AEI, will face a criminal probe in the United States as a result of the accusations leveled against it. Under the Foreign Corrupt Practices Act, it should. Jaguar Energy’s troubles began in July, when local prosecutors and CICIG investigators charged a high-level company employee, Rafael Ernesto Córdova, with “illicit association” or conspiracy. According to Guatemalan press reports, Córdova is an American citizen with a long history working for AEI subsidiaries. Jaguar Energy, at Córdova’s direction, is accused of having transferred $120,000 over six month to a series of intermediaries before it ended up in the account of the Guatemalan president’s private secretary (and son-in-law), Gustavo Adolfo Martínez. The money was paid in exchange for government favors. For instance, prosecutors say Jaguar Energy used its purchased influence with Martínez to get meetings with the president, as well as privileged information about regulatory, financial, and immigration matters from high government officials. In one instance, according to CICIG, it used its influence to try to block a Chinese diplomat from entering the country to visit a group of Chinese employees that were in a labor dispute with the company. In another, it used its connections to try to delay payment of port tariffs in Guatemala. Using phone intercepts, photographic evidence and other methods, prosecutors took months to unravel the complicated web of personal relationships and financial remuneration that allowed this influence racket to flourish. At the July press conference announcing the first arrests in the Jaguar case, CICIG commissioner Iván Velásquez described the payment scheme. “Naturally Mr. Córdova could not pay Mr. Martínez directly,” he said. Instead, a woman named Karen Cancinos served as an “intermediary to receive the money through a fictitious consulting contract with Jaguar Energy.” The company paid her six $20,000 installments between June 2014 and January 2015, Velásquez said, even though she did not provide it with any services. Cancinos is accused of funneling the money to the main organizer of the Jaguar scheme, Cesar Augusto Medina. From Medina, a portion of the money allegedly made its way to Martínez and the upper reaches of the Guatemalan government. Martínez, Medina, and Cancinos have been in jail since July. Julia Barrera, a spokeswoman for the Guatemalan Attorney General’s Office, confirmed that there is an active arrest warrant out for Ernesto Córdova. He has not yet been apprehended, however, and she could not confirm whether he remains in Guatemala. Despite the involvement of an American citizen in this case, and despite the central role of a US-registered subsidiary whose parent company is managed out of Houston, neither Córdova nor Jaguar Energy has received substantial coverage in the US press. The company’s alleged corrupt practices have been overshadowed, in large part, by the fanfare surrounding the Guatemalan president’s resignation and imprisonment in September. AEI, meanwhile, has remained tight-lipped about the accusations against its subsidiary. Neither it nor Jaguar Energy Guatemala would respond to requests for comment. If Ernesto Córdova engaged in the conspiracy of which he is accused, he, his employer as well as AEI and its affiliates, could face a criminal investigation in the United States. Under the federal Foreign Corrupt Practices Act, US-based companies, as well as US citizens, are prohibited from participating in bribery and other kinds of corrupt schemes meant to influence foreign officials. Penalties for breaking the law include jail time and heavy fines. Prosecutors say Jaguar Energy used its purchased influence with the president's private secretary to get meetings with the president, as well as privileged government information. The evidence is compelling. Despite its complicated corporate structure, AEI’s management operates out of Houston, Texas. Many of its board members, executives and top managers are US citizens. And an employee of its wholly owned, US-incorporated subsidiary is neck-deep in an alleged corruption scandal. Matteson Ellis, a lawyer and FCPA expert with the firm Miller & Chevalier, says this kind of case often draws interest from the Justice Department. Whether the Justice Department has already started looking into the matter, however, is an open question. Either way, Americans have yet again played a part in the unraveling of a Guatemalan government. This time, however, justice might prevail.